Chicken — takeout chicken even — can be awesome, when the dish begins with high quality ingredients marinaded with bold flavor and grilled over oak coals. After just a few minutes at a drive-through or walk-up window you can have a picnic in your office, or at an actual park, that will make you fall in love with chicken again. Price: Expect to spend $12 – $15; the 1/4 chicken special is $9.50. Rotisserie chickens have become the norm in grocery stores, but sadly, most are dry and boring. And a good slow roasted or smoked chicken takes time that most of us don’t have at lunchtime. The scarcity of really great chicken you don’t have to make yourself makes Fresa’s Chicken al Carbon that much more of a delightful surprise. A quick hop out of downtown, and without even a hop out of your car, and you too can enjoy juicy chicken in all sorts of preparations. The foundation of Fresa’s fantastic chicken is locally pasture-raised chickens from Vital Farms and that makes all the difference when it comes to flavor. 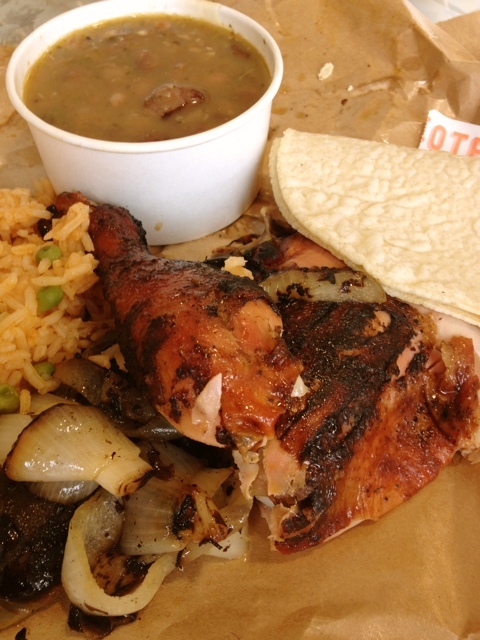 When you consider what to have for lunch you can go with the the classic – a quarter of a roasted chicken (dark or white meat), complete with rice, beans, and tortillas. Fresa’s offer’s two flavors of chicken: anchiote citrus which takes me back to the time I spent traveling in the interior of Mexico and fresh oregano and black pepper which is subtly flavored but not a taste you’ll soon forget. Looking for a sandwich for lunch? Try the chicken on a crusty roll. They have three different options, including a vegetarian one, but my favorite is the classic with avocado, queso fresco, and chipotle mayo. Tortilla chips round the sandwich out nicely but I have a hard time passing up the grilled Mexican street corn. 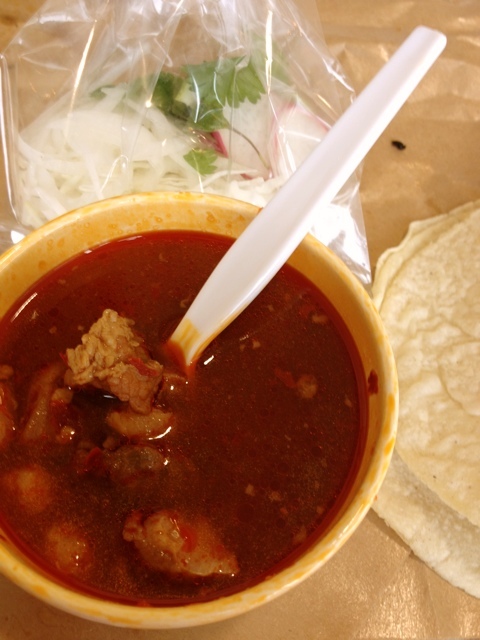 On a cool day, or when you are headed right back to an air conditioned office, be sure to try the pozole. This traditional Mexican soup is made with rich red chiles, pork, and hominy. Be sure to sop up every last bit of spicy broth with corn tortillas. The lunch menu rounds out with salads (available with and sans chicken) and sides that include potato salad, a fruit cup, and grilled vegetables. And did I mention the street corn? Because there’s street corn. And you really should try it. 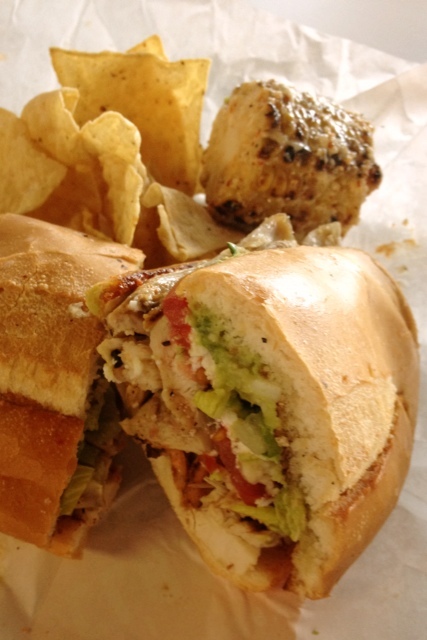 So to be clear, lunch at Fresa’s isn’t your typical takeout. If you really want to torment your office mates run out and grab some Fresa’s right before a lunch meeting then sit and enjoy, licking your fingers noisily, while everyone else mulls the sad sandwich or heat-and-eat dinner they’re having. Or, I suppose if you really like your co-workers, you could bring takeout for everyone and be hailed as the hero of lunch.